If you use Tcl/Tk for GUI programming, you should know about Tkpath, a replacement for the built in canvas widget that adds antialiasing, full alpha transparencies and more. The project is still in its infancy, but it’s already quite usable. If you’re trying to make good-looking charts or pictures with Tk, you owe it to yourself to check it out. Seriously, take a quick look at the demos. It’s OK, I’ll wait. One area where Tkpath shows its immaturity is in the API, which is still pretty rough around the edges. For some picture elements, like arcs, you actually have to use SVG syntax to describe the path you want. That’s obviously possible, but I don’t think that anybody would call it a particularly easy to use interface. In fact, it took me the better part of a weekend to figure out how to make arcs with Tkpath (starting with absolutely no knowledge of SVG syntax). In hopes that it will save somebody else some pain, here’s what I learned. Unlike the built-in Tk canvas, Tkpath does not have a dedicated arc item, at least not yet. Instead you use the generic path item, which is just an interface for specifying raw SVG paths. The Tcl syntax for creating a path is deceptively simple: pathName create path pathSpec ?options?. The magic is all in pathSpec, which is where you stuff an SVG path description. Each drawing command consists of a single letter to identify the type of command, and some number of arguments, determined by the type of command. Each command updates the current location of the drawing pen; this location is an implicit argument for the next command. For example, the line command draws a line from the current location to the location explicitly given as an argument. Commands are case-sensitive. For example, “M 100 100” is not the same as “m 100 100”. When the command name is upper-case, then coordinate arguments are treated as absolute; when the command name is lowercase, then the coordinates are interpreted relative to the current pen location. The moveto command must be first in any sequence of commands. moveto M x y The moveto moves the pen from the current location to the specified location without drawing any line or curve between the points. arc A rx ry rot large direction x y The arc command draws an elliptical arc from the current location to the specified location x,y. rx and ry give the radius of the ellipse along the x- and y-axes. rot gives the x-axis rotation. large indicates whether the arc is at least 180 degrees. If so, it has value one; otherwise it has value zero. direction indicates the direction in which to draw the arc: one for clockwise, zero for counter-clockwise. wm title . 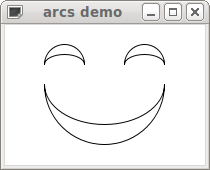 "arcs demo"
.c create path "M 40 60 A 60 60 0 1 0 160 60 A 60 40 0 1 1 40 60"
.c create path "M 40 40 A 20 20 0 1 1 80 40 A 20 10 0 1 0 40 40"
.c create path "M 120 40 A 20 20 0 1 1 160 40 A 20 10 0 1 0 120 40"
Once you know how to do it, making arcs with Tkpath (or SVG, for that matter) is not too hard, although I think there’s room for a dedicated arc item, even if that’s just a simple wrapper around SVG paths. If you want more information about Tkpath, you can try the home page, or the user manual. ← Are you using the right colorspace?